Spencer Monroe is perhaps the most useless still-living member of Rick’s team. When the Wolves were attacking Alexandria and the Zombie Horde was bearing down, Spencer spent his time hiding in a truck. It should come as no surprise that he seems to have no problem with his new lifestyle as Negan’s fetch boy. He and Rosita aren’t getting along because of it. 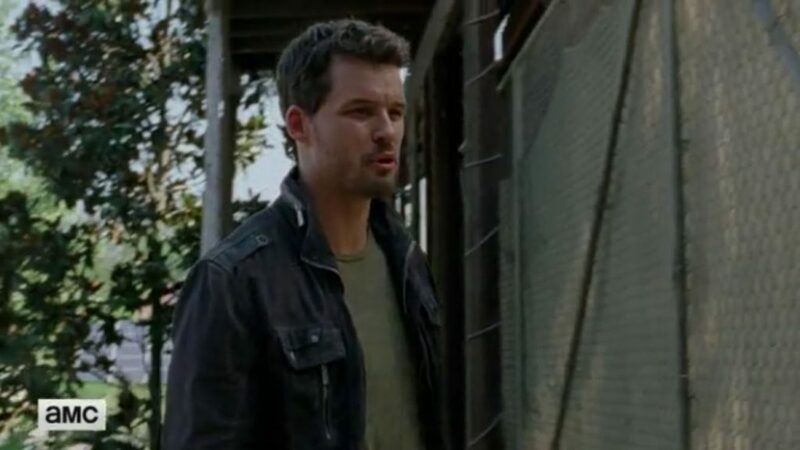 In this new sneak peek from Sunday’s episode “Sing Me A Song,” she thinks they should fight back, while he sees the moblike weekly tribute to the Saviors as “taxes.” Rosita asks Spencer if he thinks he could be a better leader than Rick. Spencer says yes. HA! A different website has been given the exclusive Sneak Peek every week. This week it was TV Guide, so sorry about the expand button not working (it’s one of many things about TVGuide.com that doesn’t work). if you’d like a second look at “Sing Me A Song,” we also have the clip that appeared during Talking Dead With Elvira (no, really, Elvira was on last week). It is Michonne walking up a road. The rest of the episode will play out this Sunday at 9 on AMC.